In May 2014, there was a feature request asking for this functionality in RuboCop, and it was rejected by the head of the project. Request: Right now when I try to run rubocop on an erb template it does not parse out the ruby code.... It's saying that you're doing a lot of stuff in one method. You could try breaking it up into smaller methods. Another idea is to remove some of the duplication. No subsystem: Bug: RUBY-19368: Always indexing after upgrading to RubyMine 2017.1: Bug: RUBY-19527: 2017.1.2.rc1 broke all run configurations other than rails... Add a file called .rubocop.yml to the root of your project. Then open it to configure which checks you want it to carry out for each file in your project. Then open it to configure which checks you want it to carry out for each file in your project. Running rubocop. You can run rubocop from the command line: $ rubocop . Some of the changes can be applied automatically, to do this run with --auto-correct how to pass metro authorized officer cognitive test melbourne To actually use this output for your configuration, paste it manually to .rubocop.yml , or run gry >> .rubocop.yml . Keep in mind that running Gry may take some time. The more code in the project, the longer it will take. Rubocop itself is just a gem that you can include as a development dependency in your project and it provides a handy rubocop cli and several rake tasks which you can either run manually or as part of your CI test suites. Pass the --rails option to enable rails specific rules. $ rubocop --rails For me, when I tested this with my end of Bootcamp project @lewagon I had 1188 offenses. 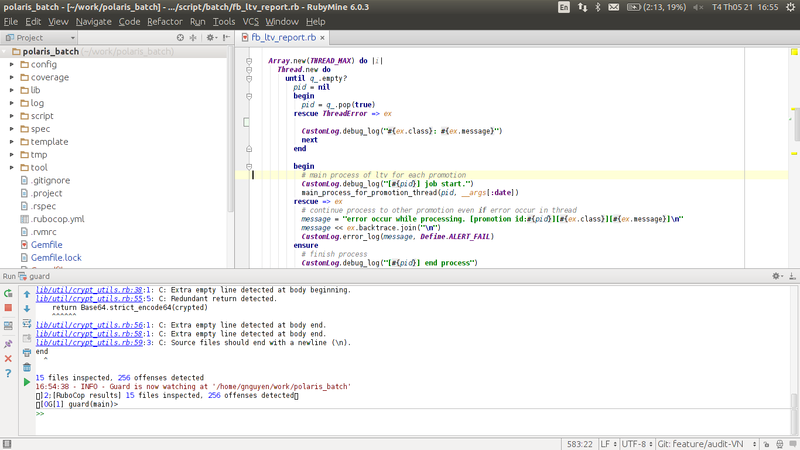 Let's say that I modify a number of ruby files in my rails project. I haven't yet written tests that will exercise all of my changes. I haven't yet written tests that will exercise all of my changes. Is there a way to ensure that all of my *.rb files compile without directly exercising them at runtime?